Gerry Slutes Kern, 92 of Bentonville passed away peacefully on November 21, 2018. Gerry was born on June 13, 1926 In Cleveland, Ohio to Howard and Helen Slutes and was preceded in death by her parents and her brother, Howard. Gerry is survived by the love of her life - Joe – her husband of 69 years; 3 daughters, Ruth Anne Bush and husband, Gary, Nancy Kern Fruitman and husband, Morris, Donna Jo Exner and husband, Ernie; 3 grandchildren, Sarah Bush Gavia and husband, Victor, Timothy Bush and wife, Adina Garcia Bush, Megan Jo Exner, and 2 great grandchildren: Natalie and Lacey Bush…and many dear friends across this land. Gerry and Joe met at the Texas School of Mines in El Paso, Texas. Both graduated with degrees and UTEP became the new name for the School of Mines. They were married in the El Paso Presbyterian Church on September 13, 1949. Joe grew up in Carlsbad, New Mexico and the couple moved there soon after their daughter Ruth Anne was born. Three years later Nancy Jane was born and 12 years following Donna Jo was born. Joe worked at the local potash mines and Gerry was a substitute teacher and a fabulous homemaker. The girls would come home from school to homemade brownies and cupcakes and big hugs from their Mama daily. Saturdays were spent with doing chores, maintaining the pecan trees in the backyard, and then going on a picnic. Sundays were filled with Sunday School and church, naps and family time. 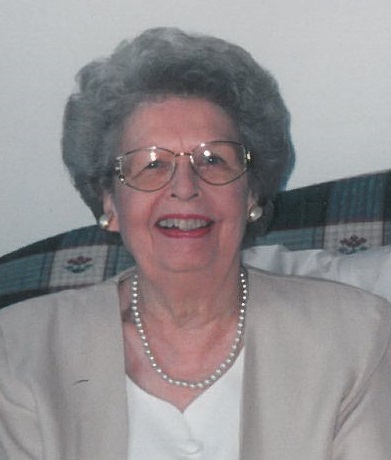 Gerry was a PEO and enjoyed her time in the Delta Gamma Sorority. Vacations were spent in San Antonio to see Gerry’s folks and brother. Always a good time! Joe was transferred to Boron California when the US Potash Company shut down their operations in Carlsbad and worked at US Borax mine. Gerry taught in the Boron Elementary School. Four years later Joe and Gerry moved to Valencia, CA where US Borax headquarters was located. Gerry had a new career as an Avon representative and excelled to Presidents Club status. She and her good friend Alberta Bock became quite a team. Laughter and shenanigans were plentiful! After Joe retired in 1989 they moved to Bentonville, Arkansas to be with their youngest daughter Donna Jo, Ernie and Megan Jo Exner. While residing in Bentonville, Gerry and Joe enjoyed bible studies and home groups through their First Presbyterian church, bridge, TOPS and being a part of Rogers Mall Walkers; and Gerry loved playing solitare while looking out the window at the trees and birds. Joe and Gerry enjoyed many vacations in Maui, Hawaii with all their children. This was a highlight of their lives. Joe and Gerry also lived a life of service – to their church home as elders, volunteers at Grace Resources – a local food bank in California; among others. Gerry lived her life with a standard of excellence, honesty and love. She gave freely of her heart and never spoke a bad or ill word of anyone. The adjective most used to describe Gerry is “sweet.” She was sweeter than could be; yet she was a strong woman in spirit! Her treasures on this earth were her husband and children, parents and brother. Funeral services will be held at 10:00am on Friday, November 30, 2018 at the First Presbyterian Church of Bentonville, Arkansas with the Reverend Katie Cummings and the Reverend Georgia Senor officiating. In lieu of flowers, please consider memorials to First Presbyterian Church or a charity of your choice. The family would like to thank everyone who attended to Gerry in the last couple of months. Arrangements by Stockdale-Moody Funeral Service of Rogers.